Visitors have lots of great attractions and activities in the local area to keep them entertained and happy. There are Denlethen Woods to explore and the Cairn O' Mount with its breathtaking viewpoint. A visit to the spectacular Dunnottar Castle is not to be missed. 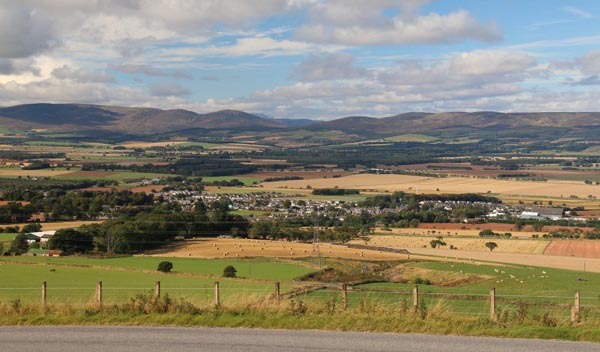 When it comes to castles you will be spoilt for choice in Aberdeenshire - Royal Deeside is closeby and the Castle Trail provides a fascinating day trip. There is also Stonehaven’s Open Air Pool – with heated clean sea water which makes for a special and exhilerating dip! The nearby pretty villages of Fettercairn and Edzell are delightful to stroll around. If you like a dram or two there is the Fettercairn Distillery (one of Scotland's oldest and nestled at the foot of the Cairngorms), which offers guided tours and a chance to sample its fine malt whisky. The Grassic Gibbon Centre at nearby Arbuthnott celebrates the life and works of the local Mearns novelist and author of the Sunset Song (one of the most popular Scottish novels) - there's also an excellent cafe! The beautiful Montrose Basin is well worth a visit and its visitors centre is popular with all ages. The cottage is just 7 miles from the beautiful St Cyrus beach - one of many blue flag beaches in the area and usually very empty. If you prefer to be more active then there are many excellent golf courses nearby and at Auchenblae there is a small 9 hole golf course known locally for being a bit demanding! You are surrounded by beautiful countryside so there is plenty to do for the outdoor enthusiast - fishing, cycling, riding, sailing and hill walking to name just a few activities available. 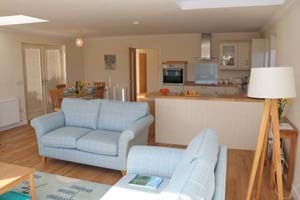 Cedar Holiday Cottage is a delightful, spacious, newly built cottage for 4 people, all on the one level. 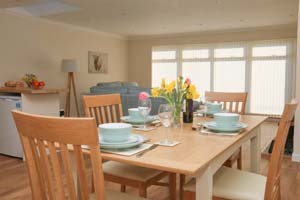 The house has a wonderful open plan, social space for guests to relax in together. 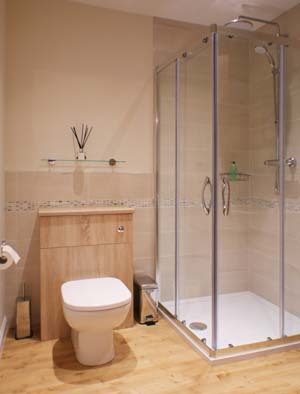 There are two bedrooms (a double and a twin) both with ample storage – the double has a luxurious ensuite shower room. Also there is an equally gorgeous family bathroom with separate bath and shower. 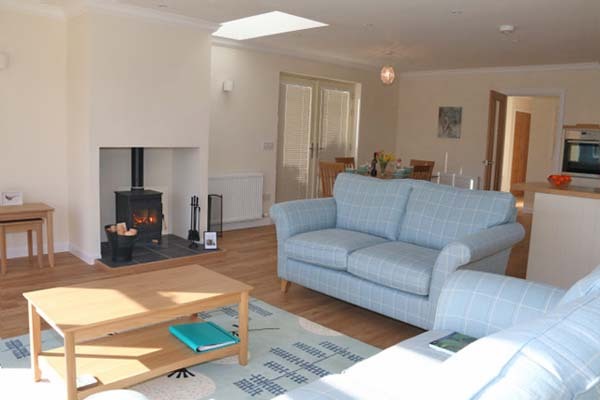 The cottage has an amazing open plan living/dining/kitchen area which is perfect for relaxing in, with a wood burning stove, a large glass end window, well equipped kitchen and a dining table for up to 6 people. There is a separate utility room with Bosch washing machine, Bosch tumble dryer and also a clothes pulley. To the front of the property there is private off street parking for two cars. At the back there is a private raised suntrap patio to relax in, with your own gate into the Memorial Park. The far reaching views over the surrounding countryside from the back of the house are stunning. 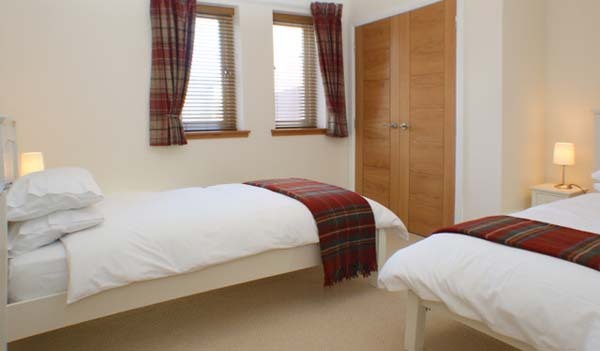 The cottage is in Laurencekirk, directions will be provided on booking. Gas central heating, logs and briquettes for wood burner are included. Bed linen and towels, tea and coffee and some milk for arrival. Nothing like a cuppa when you reach your destination! Washing powder and softener, Scottish Fine Soaps toiletries are also included. No specific change over day, the owners prefer a more flexible approach. Check in 4pm and check out 10am - though the owners are flexible when at all possible. 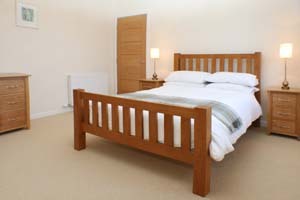 Short breaks all year round, minimum stay 3 nights. 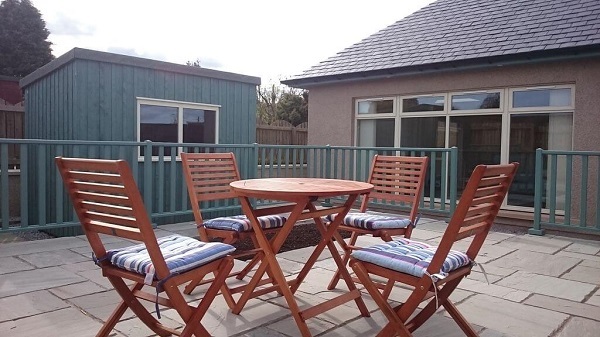 To book this delightful self-catering holiday cottage in Laurencekirk, click the enquiry button below and see availability and rental prices. This newly built 2 bedroom house is in a pretty village and is very well designed and comfortable. 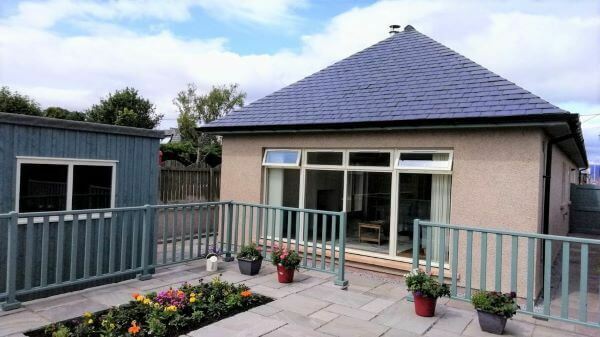 If you're looking for an Aberdeenshire country cottage then this is ideal - the area offers everything you might want to see and do on a Scottish holiday; from castles and distilleries to golf and beaches!